This story was updated at 7:00 p.m. EST. 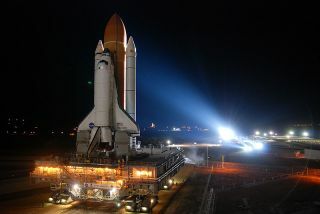 After an hours-long meeting at the Kennedy Space Center in Florida, NASA's top officials unanimously cleared the space shuttle Discovery for its final launch next Thursday (Feb. 24). NASA shuttle managers made the decision today (Feb. 18) during the mission's Flight Readiness Review, where they discussed the current state of Discovery, the International Space Station, and the astronauts who will fly the orbiter on its 39th and final flight. "I can't say enough about the work the teams have done, they did a tremendous job," Bill Gerstenmaier, NASA's associate administrator for space operations, said in a news briefing today. Discovery is targeted to liftoff from Kennedy Space Center in Cape Canaveral on the same day that the European Space Agency's Automated Transfer Vehicle-2 (ATV-2) cargo ship is scheduled to arrive and dock at the space station. Initially, NASA officials thought the space traffic jam would force mission planners to delay Discovery's launch by one day – to Feb. 25. But, NASA officials decided early in today's meeting that changing the shuttle's launch date is not necessary. "The ATV is going to dock about six hours before we launch," said Mike Moses, NASA's shuttle integration manager. "We will have tanked the vehicle by then. If they run into a problem during docking, we still might launch that day, we might not – we'll have to talk about that one in real time." The unique photo opportunity was discussed during today's Flight Readiness Review (FRR), but aNASA officials confirmed today that a final decision on the matter will not be made prior to Discovery's launch. "It's okay from a flight readiness review standpoint, but it's really up to the team to see what happens," Gerstenmaier said. NASA is ending its space shuttle program this year after 30 years of spaceflight to make way for new exploration plans that call for sending astronauts to an asteroid by 2025 and to Mars in the 2030s.